I swear I'm blushing right now, that's how impressed I am with these numbers from Bed Bath & Beyond(BBBY). They just reported earnings of 58cents per share for the fourth quarter versus Wall Street expectations of 43cents. Granted, there were rumors and "whispers" that the 43cent estimate was conservative, but this is still a fabulous "beat and raise" quarter. Meaning they beat expectations and raised future guidance. This quarter had it all -->> in addition to beating revenue estimates (refreshing among all the earnings beats that have been due to cost cuts), they showed accelerating improvement in gross margin, SG&A (Selling, General & Administrative) expense control, and operating margin...and as an extra kicker they would have beat by more had they not paid a higher-than-average tax rate. Whisper numbers aside, this beat was all the more impressive considering that BBBY is among the most closely followed retailers on Wall Street. No less than 24 analysts had estimates for this quarter, and BBBY beat the street-high estimate (50cents) by 8cents! BBBY guided the coming fourth quarter ended February to earnings of 69cents versus the street estimate of 62cents with a high estimate of 67cents. 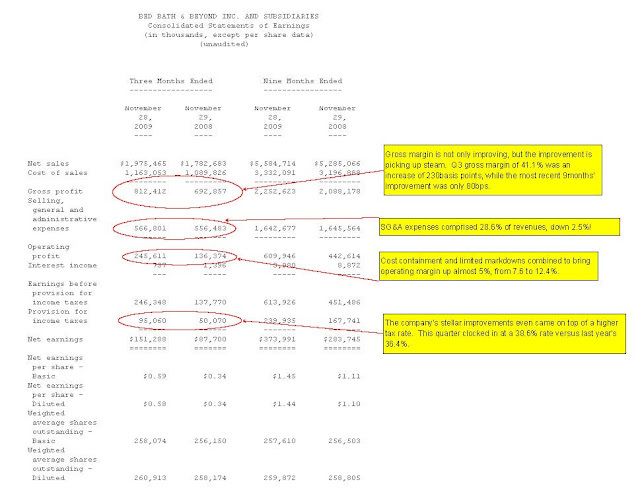 That puts full year 2009 earnings (retailers end their fiscal year in Jan/Feb) at probably a minimum $2.20 per share. That gets me to Free Cash Flow of about $659million. That amounts to a current Free Cash Flow Yield (FCFY) of about 7.3% on the company's "net-of-cash" market value....too rich for me to chase but I do love the company's performance.